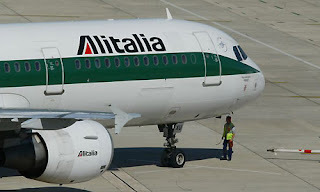 ‘Ladies and gentlemen this is your captain speaking we would like to welcome you on board this Alitalia flight to Rome. Flight duration is around five hours and eleven minutes and we are expecting a fairly smooth flight today. Once again we thank you for choosing to fly with us today and we hope you enjoy your flight.’ While the captain expected no turbulence, there was quite a bit of pre-flight commotion on this Alitalia flight from Lagos, Nigeria to Rome, Italy. It all started when we were ordered to deplane the aircraft in Lagos, Nigeria after flying from Accra, Ghana. All passengers were ordered to find their luggage, littered along the tarmac, and stand beside it until Alitalia personnel recorded who was staying in Nigeria and who was joining the flight to Rome. Well, Alitalia...that's one way to do it. Italians, bless their hearts, are not well known for their efficiency or organization. The procedure of determining passengers’ final destinations by way of unloading all bags only to reload all the continuing passengers’ luggage was brouhaha to say the least. Nigerian, Ghanaian, Italian, American, French, and British passengers were ganging up and yelling at the Alitalia flight attendants. It was the United Nations of international lawlessness. Waving his arms about, a big Nigerian man shouted at the flight attendant in words I couldn’t understand. The pretty Italian crew member shied away like a demure gazelle in the face of a roaring lion. 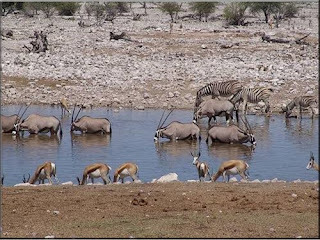 What in most circumstances would be a quick touch-down to pick up more passengers in Nigeria before making the transcontinental flight to Italy, this Alitalia stop-over turned into a spectacle akin to animals fighting for space at the water hole. Roar, hiss, squawk, chomp...however you say it, apparently it's everyone for himself. Unlike the flight from Accra to Lagos, on this over-sold flight from Lagos to Rome there were no assigned seats. All passengers stood on the tarmac knowing that if they weren’t able to get to a seat fast enough they would be left behind to catch the next flight to Rome, the next day. Once the luggage was placed back on board the pretty Italian flight attendant shouted with a melodic Italian accent, ‘you may reboard-a the aeroplane-a.’ As if at the starting line of a race, people dashed down the tarmac to the airplane. Pushing and shoving, the passengers trampled each other to board the aircraft. The flight attendant responded with an authoritative tone, ‘Sir, these people are in your former seats, and those people over there are in their former seats. There are no longer assigned seats and it is a first come, first served seating arrangement.’ She then escorted him away to another available seat. My husband I looked at each other in disbelief. This just doesn’t happen everyday where people treat each other so disrespectfully, so barbarically. I guess it is a dog-eat-dog world but we forget in an age of expected politesse. My husband is a calm, respectful, courteous person who has never in his life been in a fight. I think this was the closest he’s ever been to duking it out. This man kept intentionally pushing the package into the back of my husband’s ankle. My husband retaliated by jarring the package back into the man’s shin. This went on for the five hour flight. Both men, bruised and agitated, pushed their way off the godforsaken Alitalia flight onward to bother someone else, somewhere else. Why do we (people) bother each other so much? Are we territorial animals interfering in each other’s domain? Why is it that extreme circumstances take us back to our animal instincts? Whether it’s fighting for seats on an over-sold flight or defending one’s personal space in crammed airplane, people act viciously when pushed to the limits. Humans revert to primitive behaviour when pressured by natural survival intuitions. After millions of years of evolution is it too much to ask that we try to treat each other with respect, understanding and good will? Next time the passenger hits the recline button throwing their seat back into your face, think about it. You can revert to those primitive instincts and roar or use your human cognition and process the fact that the seat back in your face was probably not a direct attack on you- unless of course some irate Ghanaian man literally jabs your leg every five minutes. Gently recline your seat, read your SkyMall, and just relax. Kumbaya. 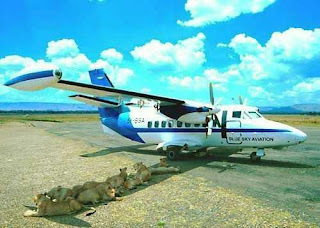 Even lions can make an orderly queue! Aggression in the air is a widespread problem apparently. Check out this article about a similar situation on a flight from DC to Accra. Crazy stuff! We flew Southwest (no assigned seats) for the first time in May and feared facing a similar situation. Mercifully, that wasn't the case. You made it through and it makes for a good story- as unpleasant as it was at the time! Really great stuff and i appreciate your work.